Hi! It’s Jeanne again! Here at dedicated Vancouver Wedding Photographers, Nirvana Photography Studios, hunting down the latest trends and creative ideas is one of our many passions to better serve the Lower Mainland. Now that Summer has fully blossomed in Vancouver, outdoor weddings are the “biggest thing”, giving great opportunities to admire the beautiful scenery Vancouver has to offer. This also allows us as Wedding Photographers to really take advantage of the sunlight brimming over Vancouver. So what could make the happiest bride smiling from ear to ear? So here is one of many “it” ideas of 2014 to really get her to light up with glee! Incorporate photos of family, friends, or loved ones who have pass on into bouquets or centerpieces. It gives a sentimental touch to all the relationships and journeys she had up till the wedding day. This can be a special way to show off your engagement photos too! 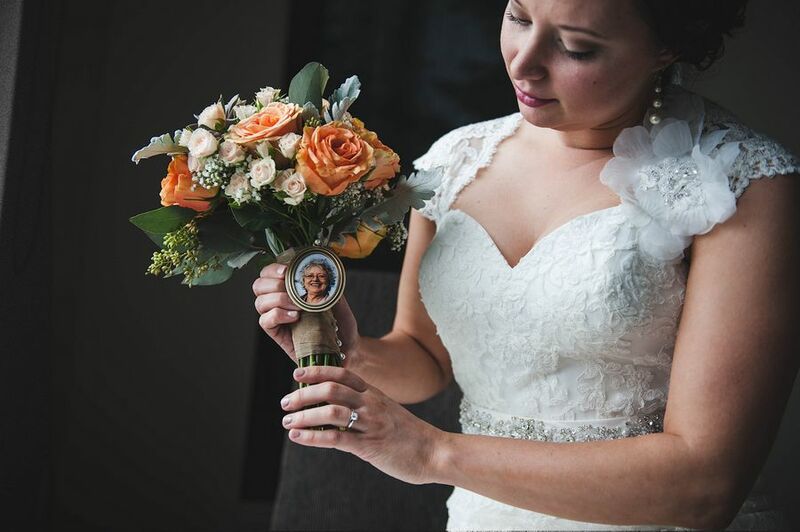 Personalizing her wedding day allows the memorable milestone to really honor this special day for her and all her loved ones. Especially for Grandma and Grandpa who may or may not be able to attend physically. The purpose of a wedding ceremony is not only to witness and celebrate the commitment of the lovebirds, but also the act of bringing two families together. What better way than to designate photos of both clans?